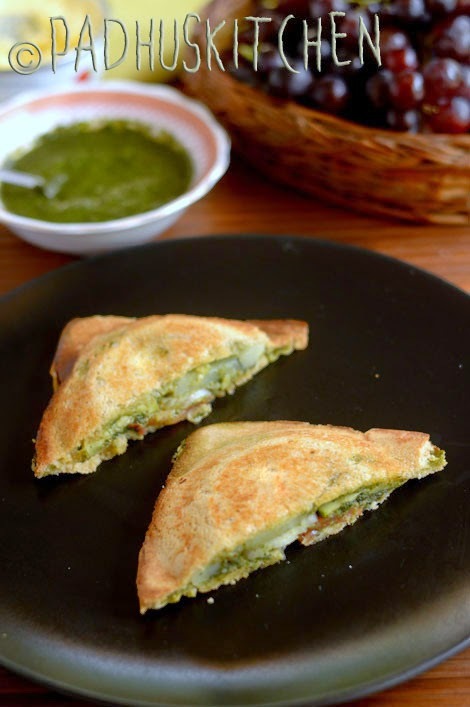 I love this Mumbai style sandwich with green chutney. If you have green chutney and boiled potatoes ready, this sandwich can be prepared in just 5 minutes time. It can be had for breakfast or as snacks or to satiate the hunger in between meals. This recipe is from a magazine's free recipe booklet. Today we will learn how to make Mumbai Style Vegetable Sandwich Toast following this easy recipe with step wise pictures. Boil potatoes, peel the skin and slice it thinly. Slice onions, tomatoes and cucumber thinly. Keep all the ingredients ready. You can use boiled and sliced beetroot also if preferred. Cut the brown corners of the bread if preferred. I skipped that. Take 4 breads, apply butter on one side for all the 4 slices. Keep 2 buttered slices aside. Now take the other 2 buttered slices. Apply green chutney on the 2 slices on top of the butter. Then place 1 or 2 slices of all the vegetables (onion, cucumber, tomato, potato). Sprinkle salt and chat masala on the vegetables. Cover it with the other buttered slice (which we kept aside), with the buttered side facing down. Toast it in an electric toaster or stove top hand toaster (as in the picture below) or you can grill the sandwiches until both sides turn golden brown. If using stove top hand toaster, grease the toaster slightly with butter and then toast the sandwich. Cut it diagonally and serve hot with green chutney or tomato ketchup. Repeat the same process for the rest of the bread slices. Have it for breakfast or enjoy it with tea. D/Padhu Greetings-Love all your Blog posts and read with keen interest.Bombay Sandwiches ---grilled with sliced vegs, boiled potato Cheese grated to order and chutney is a Treat. Padhu Kitchen explains it nicely. We make this so often and more so as it is not only easy convenient but liked by all. Looking back, I used to always order this in Mumbai as a chota snack on office work tours- in between meetings etc -My usual order was 2 sandwiches &Tea. I once found the sandwich wallah offering me a 3rd (smaller one) and I asked him why as i had ordered only 2- He smiled and said good customer Bonus Saab-I was astonished --smiled and thanked him Small gesture but kindly said, with a Smile. Thanks for the comment. I love when ppl share these types of anecdotes.